While the tattoo world is still heavily male, more and more badass women are leaving their mark on the industry (and the people of L.A.) and reshaping the culture of the industry in the process. Thanks in large part to social media and the sub-communities formed and found on Instagram, women tattoo artists have created a space for themselves to showcase their work, expand their reach, and champion each other as professional artists. It’s easier than ever to find a woman tattooist whose style perfectly aligns with your vision. Actually, it’s probably too easy. Once you’ve gone down the rabbit hole, it’s hard to stop scrolling through all their amazing work. We’ve rounded up some of the sharpest and most talented ladies in the city—besides Kat Von D—who will fill your Instagram feed with the best tattoo inspo. Fair warning: You’ll be lusting for some new ink by the time you finish this list. Roxi Satni specializes in blackwork, pointillism, and geometric tattooing. If you’re looking to get any sort of sleek, minimal design inked, she’s your girl. But more than a master of technique, Satni has carved out a niche for herself designing original, Aztec-inspired pieces. Her mixture of historical motifs and modern imagery make for some bold beauties. 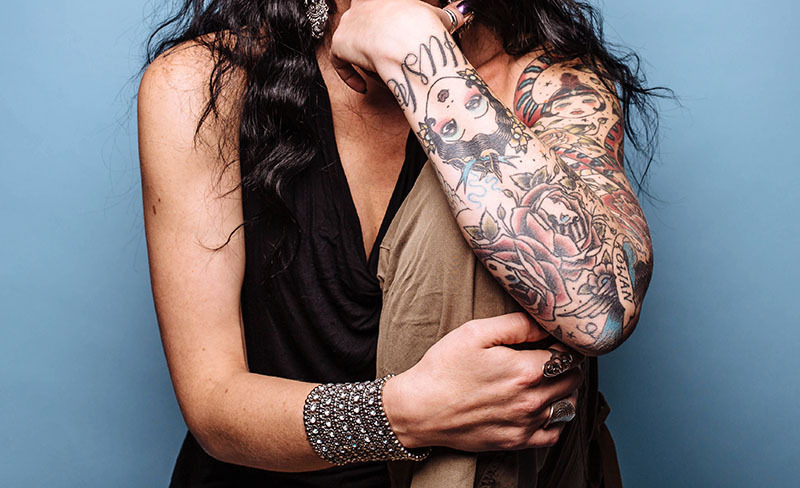 Zoey Taylor, co-owner of the Warren Tattoo in Hollywood, will make all your floral fantasies come to life. Her meticulous shadowing and delicate color-blending create a richness and luster that’s hard to come by in colored tattoos. And her black and white portraiture is equally as stunning—when it comes to detail, Zoey reigns supreme. You may remember Kim Saigh as one of the original cast members from the reality show L.A. Ink. Since her brief stint on TV, Saigh has continued to fine-tune her neo-traditional style of inking. Elaborate, wildly intricate designs are her bread and butter. As a skilled painter, Christina Ramos has excellently honed her realism and neo-traditional technique. If ever you were to slap your mama’s face (or your pup’s mug) onto your bicep, you’d want Ramos wielding the needle. Arlene Salinas is your lady for all the smash-hit classics: brightly colored and boldly lined pin-up girls, florals, hearts, and all the sailor-inspired imagery your skin can handle. Denise Teixeira-Pinto does it all, but we’re especially fond of her original designs—bold, feminine, and delightfully playful. Julie Bolene has carved a niche for herself with her Santa Fe-inspired designs. Cacti, cowboy boots, and Southwestern patterns take center stage with bold outlines and rich colors. Kari Barba, one of Southern California’s most iconic tattoo artists, is insanely talented at color realism. Her underwater designs are especially masterful (she’s become the unofficial queen of tentacle tats), but you can rely on her to bring any realist design to life. Alayna Magnan is all about new-school quirk, with her cartoonish pin-up girls flaunting exaggerated features and vibrant color schemes. If you’re shooting for a playful and polished look, Magnan is your best bet. Sara Lou’s work lies somewhere between realism and neo-traditional styles, often adding artistic, unexpected flourishes to realistic portraits and designs. Picture your pup floating in a field of poppies. So dreamy. Karen Costleigh is another all-around talent, but her skill really shines through with skeletal designs and Día de los Muertos imagery. She doesn’t stick to one distinct style, easily executing realism, tribal, traditional, and neo-traditional pieces with panache. Sugar and spice and everything nice! Alex Strangler will bring all your childhood dreams to life with her designs. She makes us want to pop open a box of Lucky Charms and watch cartoon reruns for the rest of our lives (followed by getting our favorite character tatted, because adulthood can be fun too!). Please check out her brilliant depiction of of Daria at Disneyland. Previous articleA Look Back at When a Black, Female Newspaper Editor Took on the KKK in L.A.